School gardens... Ready to Grow! 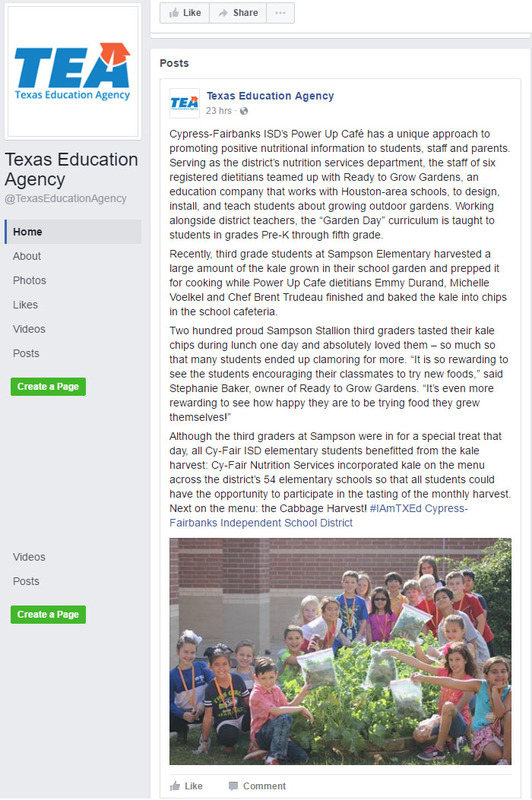 The Texas Education Agency posted a short blurb on Cypress-Fairbanks ISD’s Power Up Cafe and their team up with Ready To Grow Gardens to promote positive nutritional information to students, staff and parents. Their facebook page is here: . Here’s the text of the post. “Cypress-Fairbanks ISD’s Power Up Café has a unique approach to promoting positive nutritional information to students, staff and parents. Serving as the district’s nutrition services department, the staff of six registered dietitians teamed up with Ready to Grow Gardens, an education company that works with Houston-area schools, to design, install, and teach students about growing outdoor gardens. Working alongside district teachers, the “Garden Day” curriculum is taught to students in grades Pre-K through fifth grade. Recently, third grade students at Sampson Elementary harvested a large amount of the kale grown in their school garden and prepped it for cooking while Power Up Cafe dietitians Emmy Durand, Michelle Voelkel and Chef Brent Trudeau finished and baked the kale into chips in the school cafeteria. Want to bring healthy, organic vegetables to your school and students? Get ready to grow your own healthy organic vegetables!